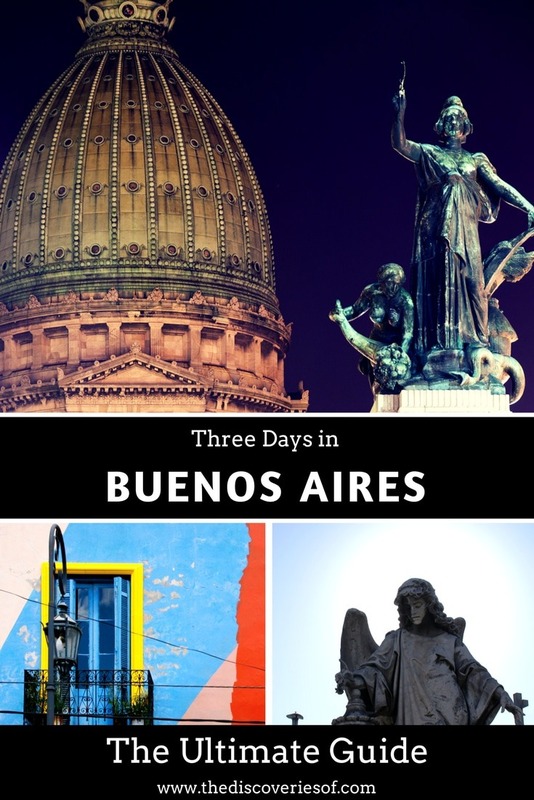 Three Days in Buenos Aires Itinerary: What to Do + See – Discoveries Of. Buenos Aires is a thriving city, filled with places to see and things to do. 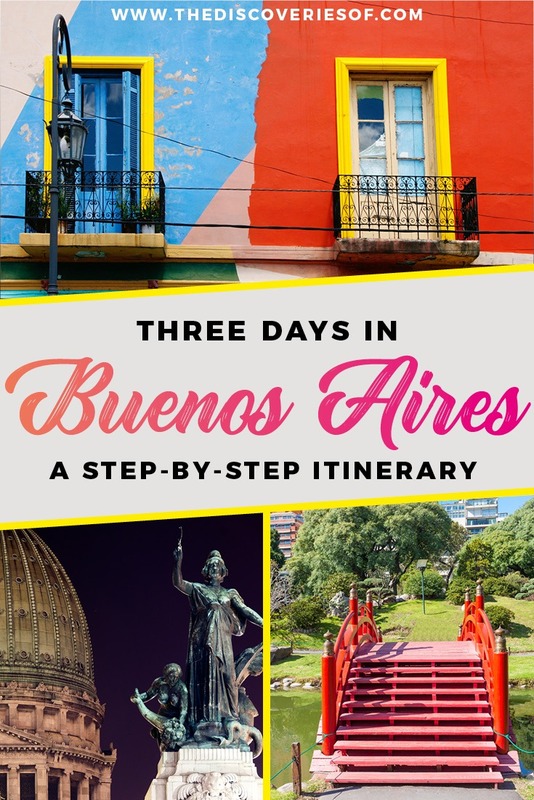 Spending three days in Buenos Aires? 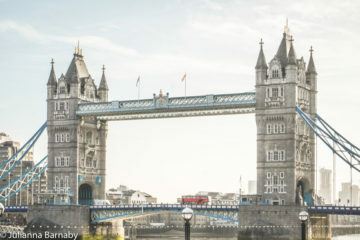 Check out this step by step itinerary to help you plan your travels. Buenos Aires is a hectic mix of old and new, stately days and all-night parties, elegant cemeteries, juicy steaks and tango. In other words, it’s not quite like anywhere you have ever visited before. How much Time to Spend in Buenos Aires? How do I Get to Buenos Aires? A minimum of three days. That way you can see a lot of the city’s main sights without having to travel at a breakneck speed. If you are trying to see Buenos Aires in a day, you can also have a great time (as long as you are willing to move at a pretty fast pace). Three days is the perfect time to spend as you’ll have plenty of time to see Buenos Aires’ biggest highlights and still enough left to do to justify a return trip (or two). If you ask Porteñas (Buenos Aires’ residents) what the best neighbourhoods in Buenos Aires are, they will give you a million different answers. Each neighbourhood has a different style and offers its own unique experience. For me, the best neighbourhoods in Buenos Aires are La Boca, San Telmo and Palermo and you should definitely spend time in each of these as you whizz around on your Buenos Aires 3 day itinerary. La Boca was previously Buenos Aires’ predominantly working-class area but has since transformed into a vibrant hub of art, boutiques and restaurants. 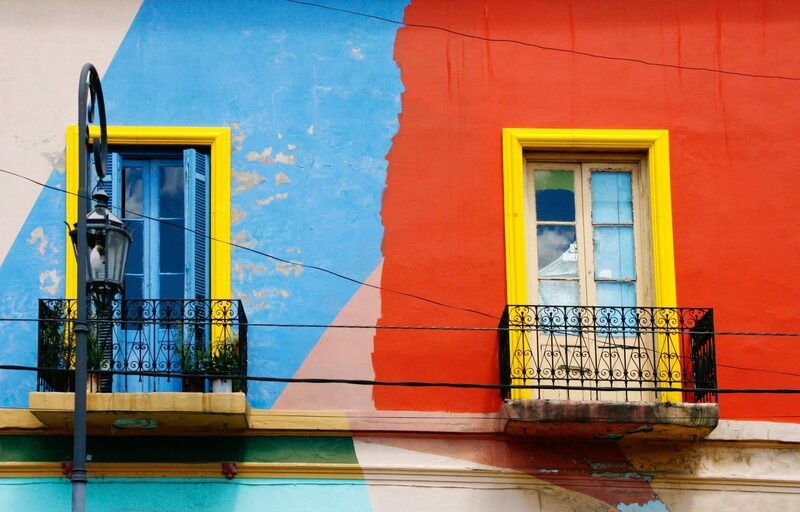 The streets are lined with colourful metal houses and the walls are beautifully painted along the Caminito, a street that was turned into a work of art by the famous Argentine painter Benito Quinquela Martin. You can’t help but enjoy the colourful charm and the array of bars, restaurants, cafes and tango institutions on offer. Keep an eye out for La Boca Stadium – home to the city’s treasured Boca Juniors football team. Every Sunday, the city grinds to a halt while fans dressed in the distinctive blue and yellow uniforms flock to the stadium to watch the beautiful game. San Telmo is Buenos Aires’ oldest neighbourhood and one of its liveliest ones too. There’s so much to see and do in San Telmo that you could be forgiven for spending the whole three days in Buenos Aires there. There are cafes, wine bars, beautiful colonial buildings and quiet squares tucked in every nook and cranny of San Telmo’s streets. The Sunday Market is Buenos Aires’ most famous – so much so that it’s got an entry of its own further down in the article. When you head to San Telmo, one of the first places that you should go it is the Plaza Dorrego: a beautiful plaza that’s surrounded by lots of pavement bars with copious seating on the tree-lined square. It’s the perfect place to while away an afternoon, watching as the city life passes you by. Sometimes the pleasure of discovering a city is just sitting down and soaking up the atmosphere and there’s nowhere better to do this than the Plaza Dorrego. While you’re in the area, you should check out the Museo de Arte Contemporaneo (see entry below) and the Museo de Arte Moderno a few doors down. The Museum of Modern Art is based in a vast building that used to be a tobacco factory. With more than 7,000 works, visitors are invited to explore the world of Argentinean contemporary art. The rotation of special exhibitions ensures there’s always something different to see. 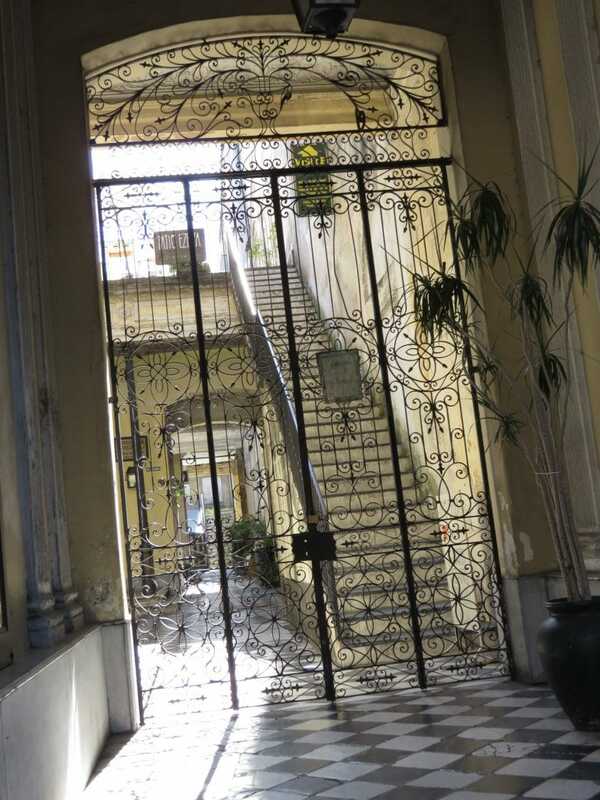 Palermo is Buenos Aires’ largest barrio (neighbourhood) so there’s plenty to see while you are in the area. 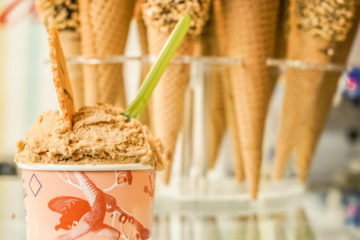 Whether you’re a foodie, an art lover, a night owl or a shopping guru, Palermo has you covered. Much of the attraction of the barrio is just wandering around and stopping off in cafes for a cortado (the coffee every Porteño swears by) and nosing around in shops but make sure you make time to visit The Botanical Gardens and the Parque de Tres Febrero for a contrast to the built-up city. 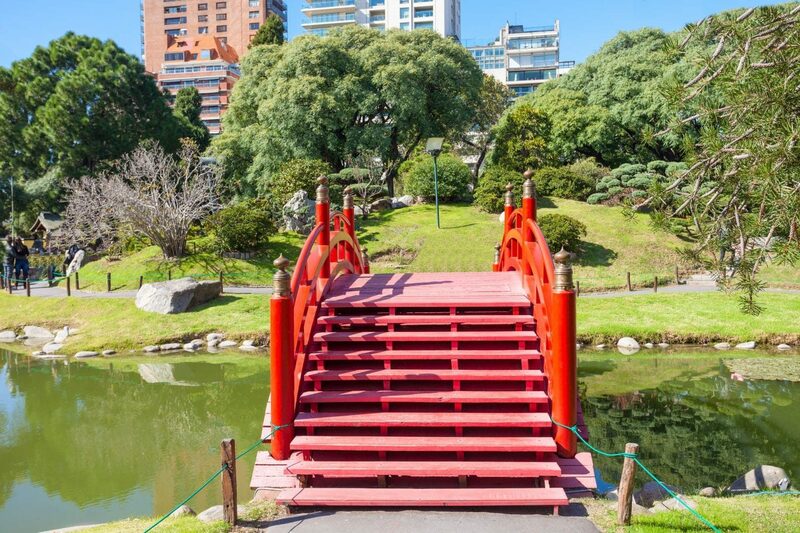 The Botanical Gardens have five greenhouses and over 5,500 plant species alone, while the Parque is a garden filled with statues of famous Argentine poets and the Japanese Gardens. There’s no end of things to see in Buenos Aires but here’s my pick of the places that should be on every visitor’s itinerary. Almost every city has a central square that functions as its beating heart. With London it’s Trafalgar Square, with New York, it’s Times Square and its the Plaza de Mayo in Buenos Aires. The Plaza de Mayo is surrounded by the Casa Rosada and the Teatro Colon on two sides, while the famous Piramide de Mayo statue lives in the centre of the Plaza, standing as a commemoration of the country’s uprising in 1810 that led to its independence. This revolutionary and political history has been upheld throughout the years – the Plaza de Mayo has provided the platform for many a political protest and gathering over the years. 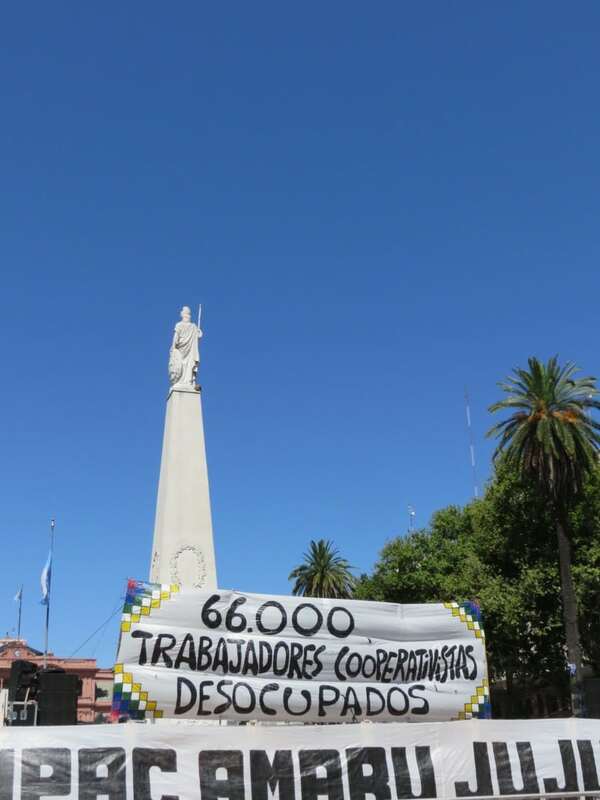 One such demonstration is The Mothers of the Plaza de Mayo, who have, for decades, been protesting the disappearance of their children during the so-called Dirty War that took place in the country in the late seventies. 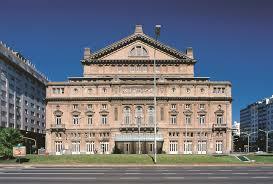 The Teatro Colon is Buenos Aires’ opulent opera house. Exuding the high-end grandeur of times past, the French stained glass windows and shimmering chandeliers provide the perfect backdrop for a night at the opera. Many a renowned performer has graced the Teatro Colon with their presence, including Pavarotti himself. Take a guided tour of the Teatro year-round. Even better, if you’re in town between April and December, book tickets to the opera or to see the ballet performed on this world-famous stage. La Recoleta was historically the home of the well-heeled Porteños, so much so that its cemetery has become its most famous attraction. 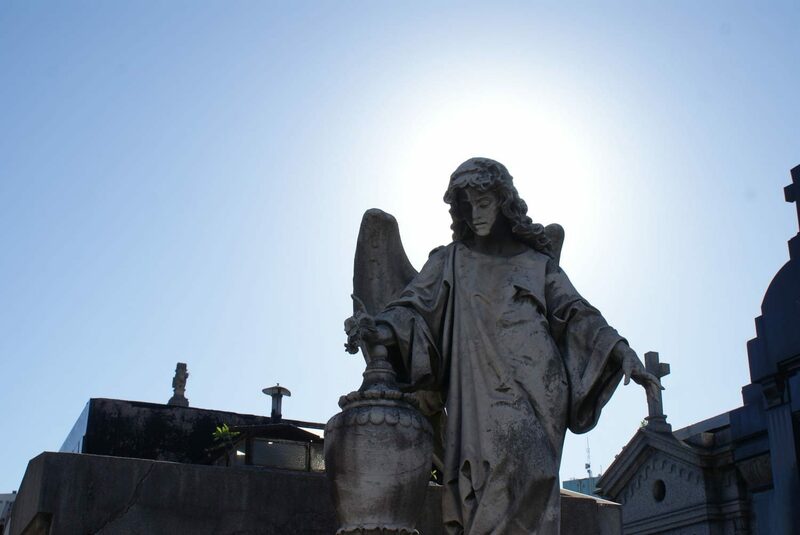 If you’re wondering what to do in Recoleta, there’s only one answer… the cemetery. Not many cities can boast a graveyard as a central attraction, but Recoleta Cemetery isn’t like many others. Home to the (deceased) who’s who of Buenos Aires society, the cemetery’s mausoleums are a work of art in themselves. Past presidents, writers, politicians, Nobel Prize-winners are buried in the cemetery, including the much-loved first lady of Argentina, Eva Peron. You can visit the cemetery independently, or as part of this Full Day Buenos Aires Walking Tour. 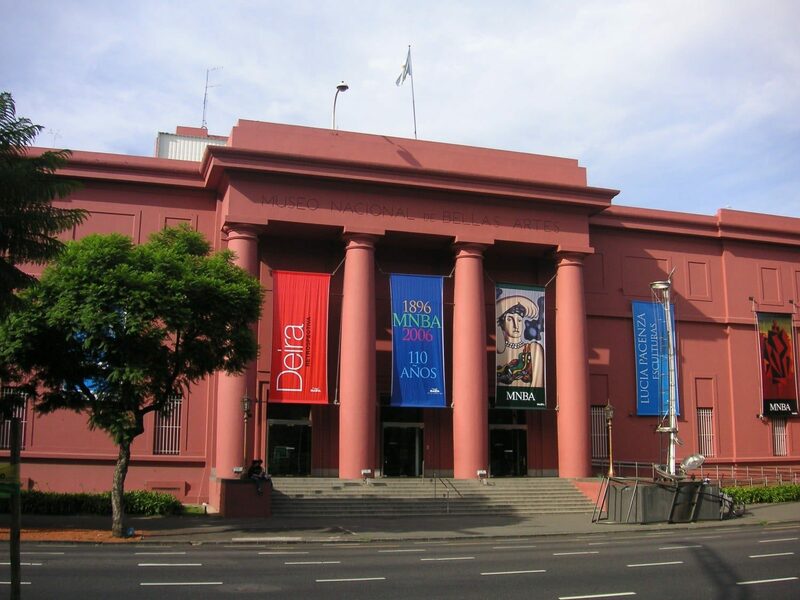 The National Museum of Bella Artes (Fine Arts) should be your first stop when you’re exploring the artistic heritage of the city during your three days in Buenos Aires. The museum boasts the largest public art collection in Latin America with a collection of more than 12,000 pieces. The National Museum of Fine Arts is most famous for its 19th Century European art collection, along with its unrivalled collection of Argentine art. Explore the 24 exhibition halls on the ground floor, keeping your eyes open for pieces by El Greco, Rembrandt, a whole room dedicated to Goya and sculptures by Curatella Manes and Rodin. Other highlights from the museum’s collection include works by, Van Gogh and Gauguin, as well as Argentine masters, Pueyrredón, Sívori, Della Valle, de la Cárcova and Cándido López. Just make sure that you have a comfortable pair of shoes on. The Reserva Ecológica Costanera Sur is the perfect place to escape from the hustle and bustle of the city and should be on the list for any nature lover visiting Buenos Aires. Spend a few hours meandering through the Reserva’s 350 hectares of land. There are lakes and meadows that house a diverse range of flora and fauna including over 200 species of birds. If you’re lucky, you might even spot one of the river turtles and iguanas that live in the Reserva. Check their website to see if they’re holding one of their monthly moonlight tours while you’re in town – exploring the Reserva Ecologica Costanera Sur at night when the wildlife is most active is an experience that should not be missed. You can easily get public transport to the Reserva, but hopping on a bike is one of the best ways to see the city. 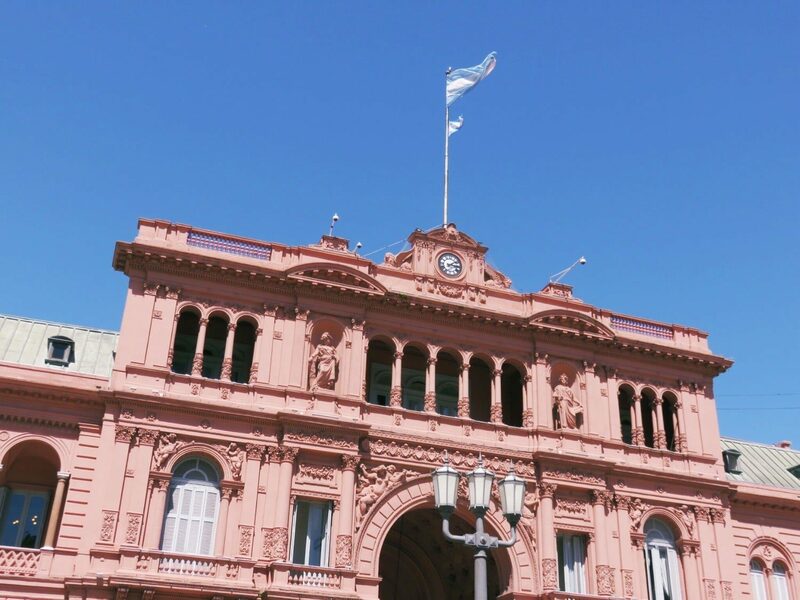 The blushing pink exterior of the Casa Rosada has made this one of the most famous buildings in Buenos Aires. 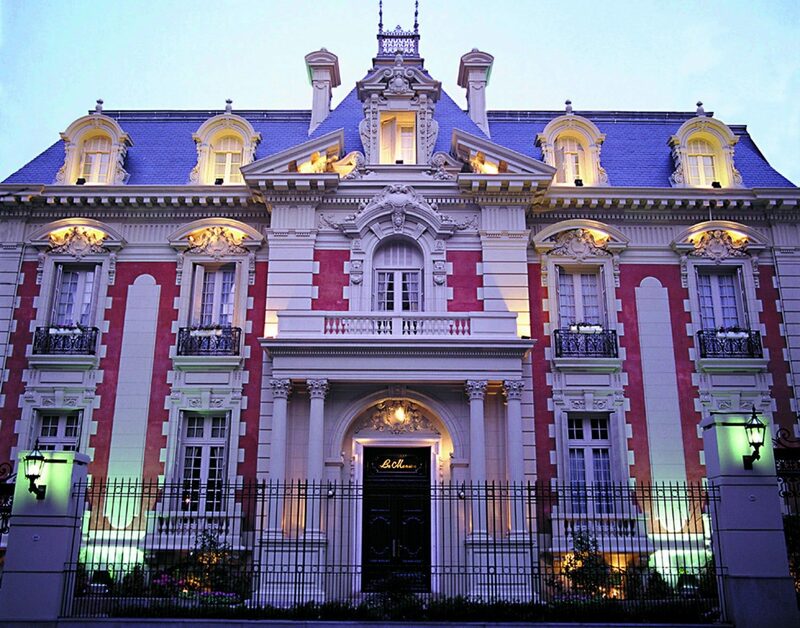 Home to the Presidential offices of Argentina, the Casa Rosada is situated on the east side of the Plaza De Mayo. The translated name is the “Pink House” (no guesses for why) – the building’s unique design and eye-catching colour is a must-see. The public is not allowed to access the Casa during the week, but you should take a free tour of the historical building at the weekend. They conduct tours in Spanish, Portuguese and English. Look out for the stained glass gallery, the President’s Office, The Patio of Palms and the Bicentennial Hall of Argentine Women. The Palacio Barolo is a stunning 22-story office block with an eye-catching design inspired by Dante’s Divine Comedy. The building’s structure is a revelation: the 100m height represents each of the poem’s cantos and the 22 floors reflect the verses per song. There are distinct areas representing hell, purgatory and heaven. You should take a guided tour of the Palacio Barolo then enjoy the exceptional views from the rooftop lighthouse after a trip to the top in the elaborate 1920’s elevator. Opened in 2012, the Museo de Arte Contemporaneo de Buenos Aires‘ stately building contains a thoughtfully curated, albeit small collection of pieces. The audio guide (included in the price of admission) is engaging, encouraging visitors to take a considered view of each piece and guiding them through the curation process by explaining the concepts and ideas prevalent in grouped works. 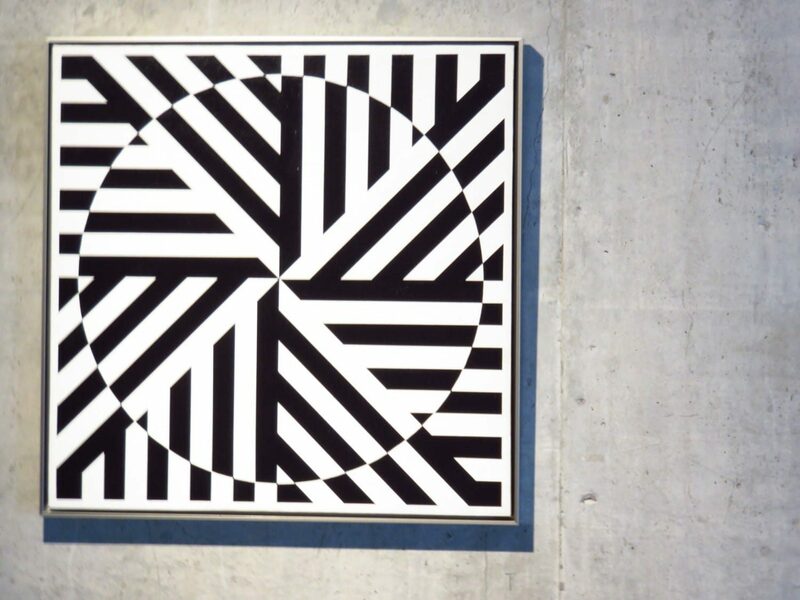 Artists featured include James Turrell, Larry Bell and César Paternosto. Travel like a local and explore these Buenos Aires highlights. No lie. I sat and stared at it. It stared right back at me. Immediately, I knew this steak meant business. Meaty, bloody, tasty business that would leave me disdainful of all other steaks I’ve had in my life…. So begins my diary entry recording my trip to Parrilla Don Julio, the best steak house in Buenos Aires. I won’t force you to ensure the remainder of the piece because it’s mostly just me going “amazing steak”, “tasty steak”, “steaky steak” “I love the steak” and so on and so forth. Steak restaurants in Buenos Aires are ten a penny but Don Julio Restaurant was a cut above. In fact, Don Julio is the only restaurant I have attended with a group of ten people where a thick blanket of silence descended on the table for the first few minutes after the steak was served. A silence that speaks of the pleasure, enjoyment and indulgence that comes from visiting Buenos Aires’ best steak restaurant. 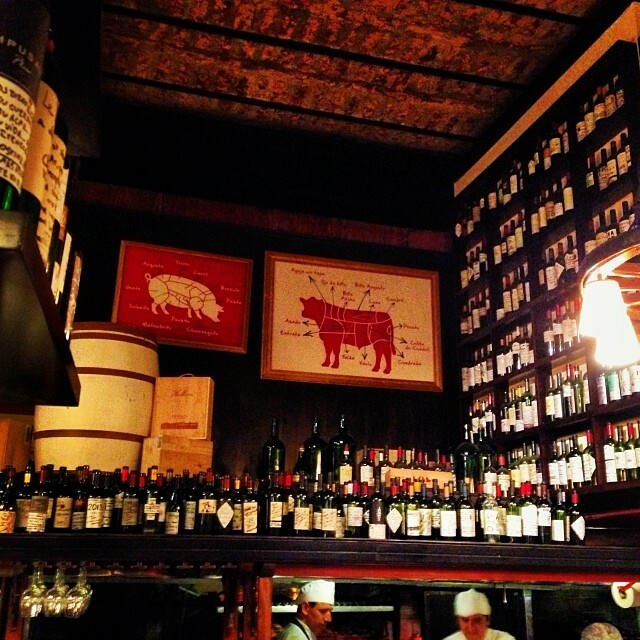 You’ll find Don Julio (otherwise known as the best parrilla in Buenos Aires) in the Palermo neighbourhood. Make sure you’re hungry before you go, and don’t expect to get a seat very quickly. Don’t worry. It will be worth it. 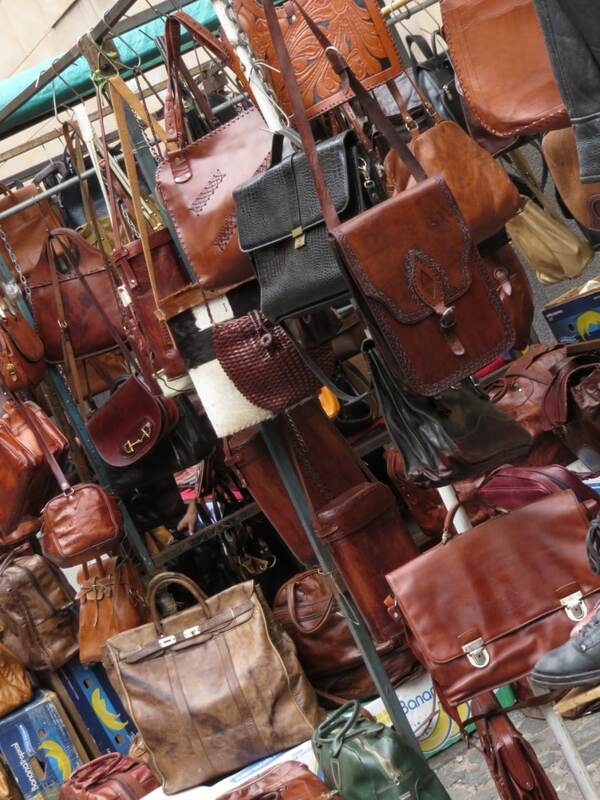 If you only have time to visit one Buenos Aires market, make it the San Telmo Market. Though the central building is open every day, Sundays are the day to go. Every Sunday, the district fills with artisan and antique stalls selling almost every conceivable item under the sun. 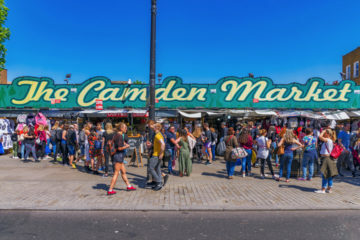 Yes, it’s touristy and the quality of the products varies widely, but there’s always free tango on show and stellar food to be had from the street hawkers. It’s well worth a visit for the atmosphere and experience alone. Don’t forget to go into the market’s main building, the Mercado de San Telmo (it was built Italian-born Argentine architect, Juan Antonio Buschiazzo, who also designed the famous Cementerio de la Recoleta). The centre of the market is Plaza Dorrego but in reality it spans a large part of the district. Generally 10am-4pm. The striking décor in Aldo’s Vinoteca would merit its entry into any list of design hotspots in Buenos Aires, but, when paired with its vast wine list covering the best of Argentina’s beloved tipple, it’s a must visit for any visitor to the city. The list is separated into whites and reds, then further divided into the country’s many wine regions. 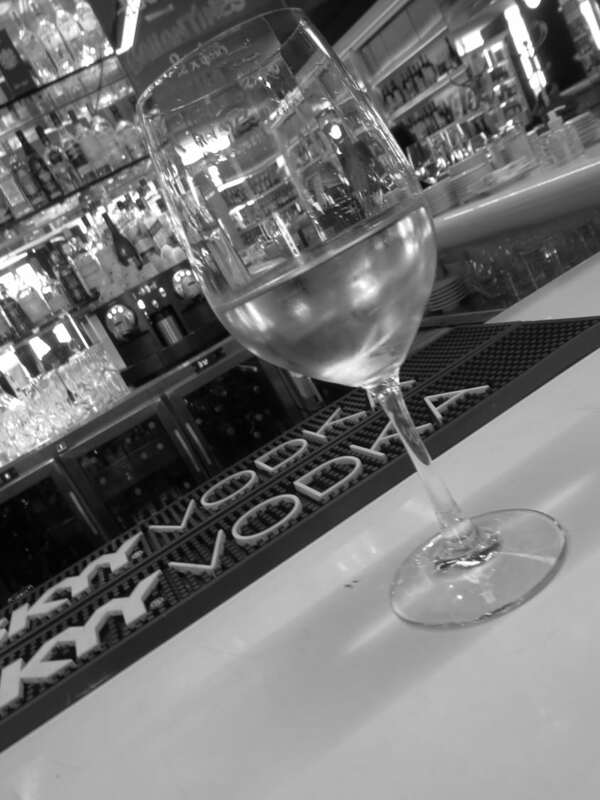 Each wine has a detailed description and the sommelier is always on hand to talk through the list and make recommendations. The prices are reasonable; a snippet of what you would expect to pay at home, generally ranging between £4 and £20. 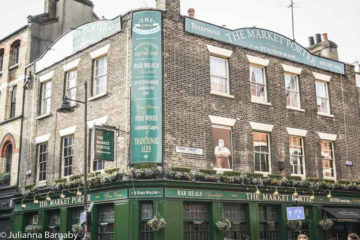 There’s even a happy hour between 5 and 8pm each day where the already reasonable prices become something of a steal. The best cafes in Buenos Aires are the ones that serve as a neighbourhood hub, hosting local gossips, leisurely lunches and numerous cortados from day to night. Origen Cafe is one such place – it’s been serving up fresh juices, healthy foods and wonderful coffees in San Telmo since 2000. It’s rare to find a vegetarian or vegan restaurant in Buenos Aires and this one is a treat for herbivores and carnivores alike. Those looking for something a little less virtuous should try one of their expertly-made cocktails or the Argentine classic, Fernet and Coke. Lunch in Buenos Aires can be a casual or a serious affair but it’s rarely done as well as it is at Roux. This bistro is just round the corner from Recoleta cemetery and should be on every gastronome’s culinary map. 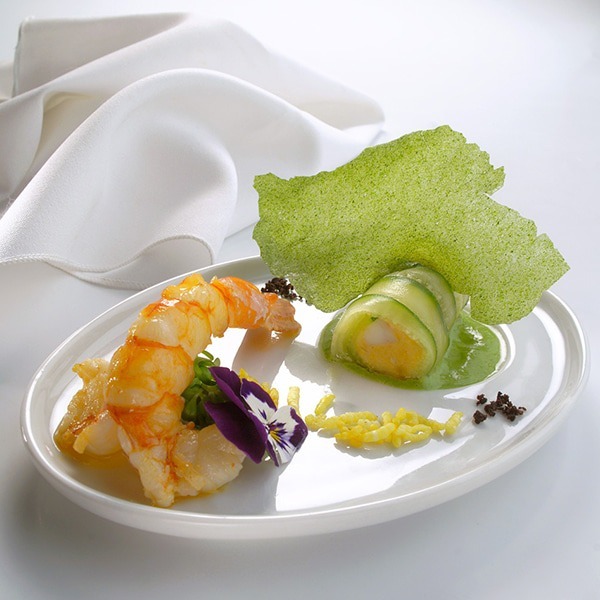 Zesty seafood dishes make a nice contrast to the steak-heavy menus in many of Buenos Aires’ restaurants. There’s no better place to sit down with a friend, a meal and a bottle to see the afternoon away. 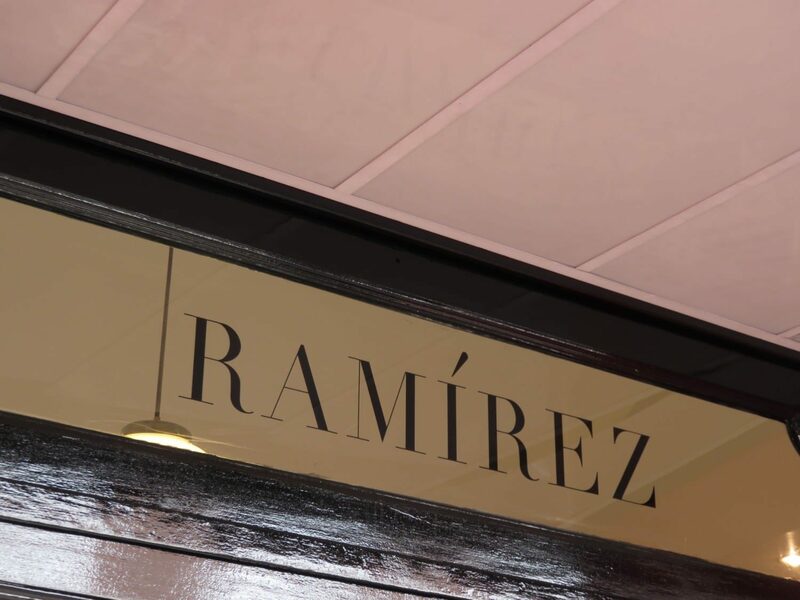 The Porteño fashion designer Pablo Ramirez opened his flagship store on Calle Peru. His sleek and understated designs are displayed in this classy boutique. Crisp detailing, decadent materials and sharp folds are Ramirez’s signature touches, lending a touch of sartorial elegance to all his pieces. A must-visit for anyone wanting to pick up a piece of Porteño style to bring home with them after their three days in Buenos Aires. 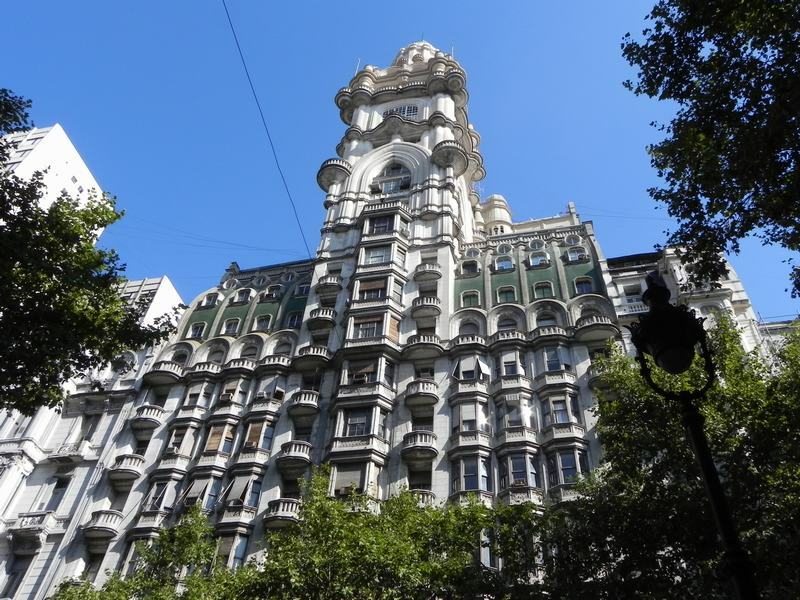 The Four Seasons Buenos Aires is located in the Retiro barrio (near to Centro and Recoleta) and provides its guests with a luxury hub in the heart of the city. As is to be expected from the Four Seasons brand, the service is impeccable, the rooms are large and spacious and the dining and drinking options are first-class. Want to treat yourself? Book in for a session in Four Seasons Buenos Aires’ Spa – reputed to be the best in the city and certainly the most decadent. Want to know what the Four Seasons experience is like? Read my review of the Four Seasons Hotel Ritz Lisbon. Taking a day trip from Buenos Aires to Uruguay is a simple matter of jumping on a ferry across the Rio de la Plata. 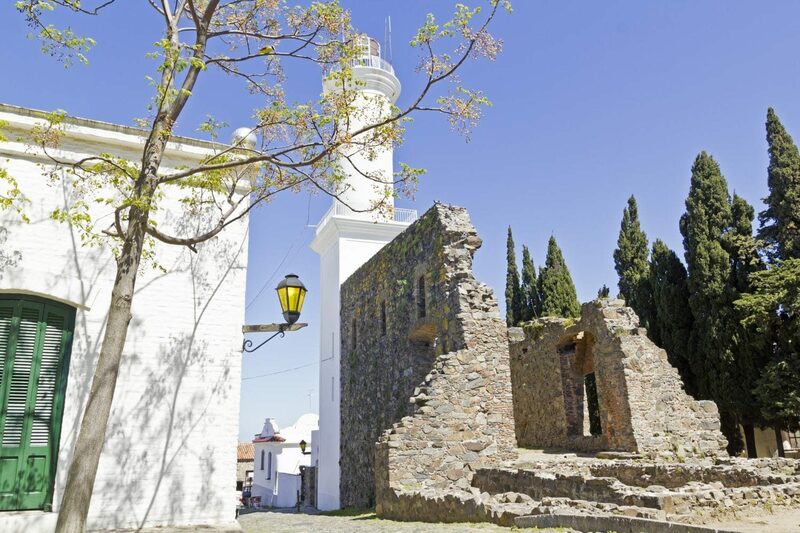 The ferry takes you to the quaint town of Colonia de Sacramento. Colonia de Sacremento’s old town is a UNESCO World Heritage Site, thanks to its gorgeous architecture and cobbled streets. Though there are a few museums in Colonia, the best thing to do if you’re visiting for the day is to walk the town’s streets, making sure you stop by the lighthouse and small marina. It’s a complete contrast to Buenos Aires and makes for a lovely add-on to your time in the Argentine capital. Make sure that you book onto one of the fast ferries – the journey time from Buenos Aires to Colonia de Sacremento varies between 50 minutes and three hours. You don’t want to spend most of your time on your day trip to Uruguay in a ferry so take the faster ferry. You must go through Uruguayan customs in Buenos Aires – don’t forget to bring your documents! You can travel to Colonia del Sacramento independently or you can book onto this full day tour to make life a lot easier. There are direct and indirect flights to Buenos Aires from all major airports. Check your flights on Skyscanner now. One word. Fly. The bus journey is longer than you thought possible. Aerolineas Argentinas fly direct from Buenos Aires to El Calafate. Check out more of my South America Travel Guides.